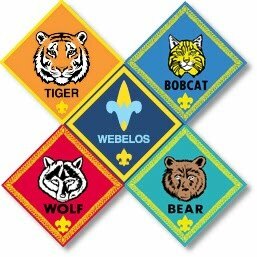 Your scout will need a Wolf Handbook (available at the Scout Shop or online at www.scoutstuff.org). Below is an outline of the material covered in the handbook. PLEASE NOTE! The brand-new Cub Scout Program takes effect for the 2015-2016 program year. There are new handbooks that reflect the all-new curriculum. Make sure you have the new book and not the old one! As a den or family, adopt a hometown serviceman or –woman, and send a care package along with a note thanking them for their service. Make two different boats and sail them. Choose different shapes for your boats. Sail your boats in the water by blowing air on the sail. While sailing your boats, notice how they are similar and how they are different. Discuss your findings with your den, and decide if you think the differences will affect the way they propel through the water.